​The Hadley Wood Association continue to press Network Rail on the implementation of their works to complete Thameslink’s Resilience Programme around our Station and tunnels. Following the successful Community Planting Day on 28 November (see below), we are in regular communication with NR to ensure the fencing and tree works (by separate subcontractors) are done as promised and keeping affected residents informed. New fencing is now in place above the North tunnel on the HWA boundary and on both sides of the Station, and around the Conservation Area. This includes the fencing by the bus stop with clearance of the encroaching ivy and branches. There is only minor fencing left to complete by Newman’s Way with some treasured old mesh fencing allowed to remain. On several stretches the existing palisade fencing has been retained, avoiding more devegetation particularly over the South Tunnel. Tree works were resumed after the New Year. The full wooded portal north of the Station remains intact and behind Platform 1 all vegetation remains apart from sycamore and ash. However these works in the middle of winter, and before site clearance of newly exposed debris, have left us again with a stark landscape including high stumps along the access road. However this is not Treegate 2 but “pollarding” which will allow us keep mature trees recovering foliage quickly. The ecologists attend every day and say nothing is being disturbed at this time of year. They have agreed to meet with a group of residents to share their knowledge of our wildlife corridor, a first event of our HWA Environmental Group. The Trial site also looks stark, but has the promise of much better tree cover before long. It should all be planted or seeded within February. The new hedge replanting behind Parkgate is scheduled as the last tree works. The Station garden area will be cleared for us. Our Community Planting turned out really well, helped by dry weather. About a hundred people were involved on the bank by the Station, many decked in bright orange hi vis, on the platform and Cycle Path. The Tree Council in particular Jon Stokes ran the show in great style from planting instructions through to managing the open air speeches on to the ceremonial planting with photocalls including children of three generations from our PreSchool, Monken Hadley and The Mount. Network Rail and their contractors were present in force to manage the site and safety. The Rail Minister came together with John Varley for the publication of his Report on Network Rail Vegetation Management. They lauded Hadley Wood as an example of turning round the original devastation to become a significant replanting Trial site. We started and ended at the Centre for volunteer planters and event helpers. We also gave hospitality at Thymari to the many travelling guests from the Rail industry including GTR and very senior level Network Rail bosses. The bank does now look rather bare and tidy, with the wire fenced Trial plots running all the way up alongside the Cycle Path and tons of chippings put on for the event, but this is a major step towards a magnificent and varied new “hedge”. The presence of senior Network managers as well as Jon Calvert and Phil Maggs (with whom we have been working since March) gave us an opportunity to secure agreement on further replanting on the other banks which suffered devastation - the east bank by the Station and the two banks south of the tunnel between Parkgate and Newmans. The details still have to agreed. We also made progress towards our Station Garden. There is a lot of work still to be done, including some new fencing but very little further tree cutting. We have saved hundreds of trees, including most trees on our tunnel portals and conservation area, in Hadley Wood - and up and down the line. We need to keep up the pressure but we should now be in the home straight. We have also laid the base for an active environmental group in Hadley Wood and connections with Tree Council and other ecology groups, Enfield and local schools. 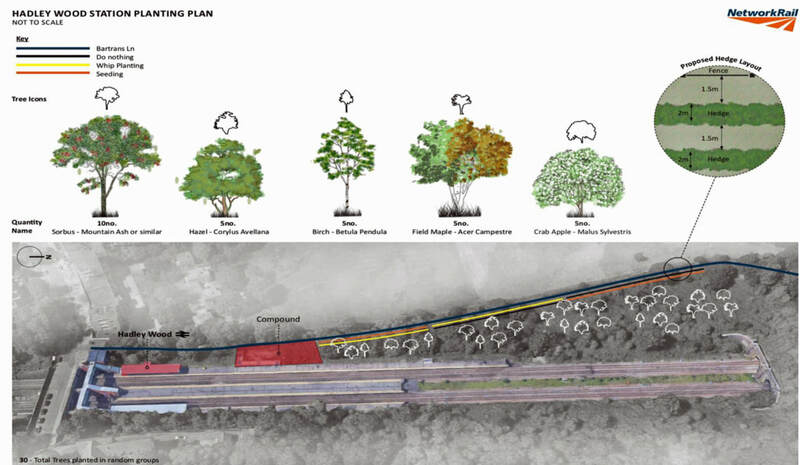 ​Network Rail project managers and contractors, with Jon Stokes of Tree Council, answered questions and accepted a number of specific requests for less tree cutting. Jon gave and repeated a presentation about the proposed Hadley Wood Trial, a five year project of comparison sites by the Cycle Path planted by seed and “whips” (saplings) alongside natural regrowth plots. There will be a Community Tree Planting Day, probably in National Tree Week (24 November to 1 December). We have been giving Network Rail our feedback and seeking agreement on the final works, scheduled to restart in November. Feedback received has continued to stress the upset at the extreme devegetation and the impact of increased noise and shaking on households particularly in Parkgate and Newmans. There is approval of the much reduced plans for completing the work, which in itself (with no poisoning of stumps) will help rapid natural regrowth. There is support for the Trial, even though it will postpone the regreening of the West Bank by the Station. Concern has been expressed about the need for good project management and support throughout the trial period (a commitment repeated by Network Rail at the event). There have been strong views expressed for more replanting particularly between Parkgate and Newmans to mitigate noise, and also on the east bank opposite the Trial for better regrowth. The Treegate Campaign has already saved hundreds trees in Hadley Wood, and a multiple up and down the line. We have taken the opportunity to be involved in the final plans and look forward to a reasonable outcome after the original horrors. Drop in event October 2018 click here for the background to this meeting for residents and rail users with Network Rail and the Tree Council at the Hadley Wood Association on Wednesday 17th October. 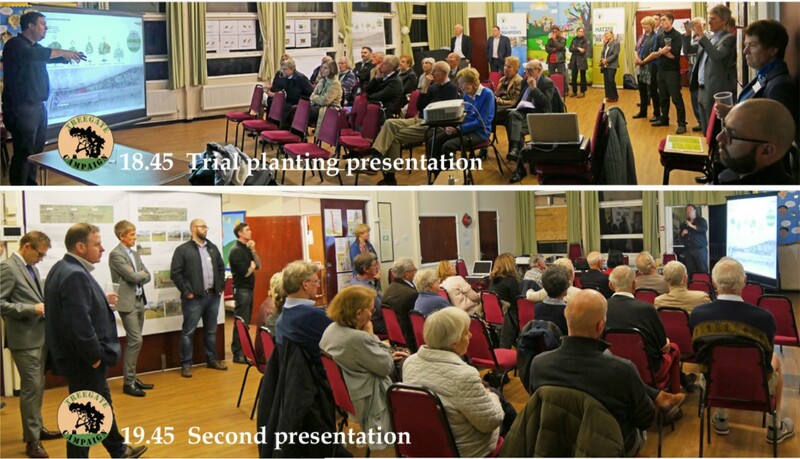 The importance of this meeting was for the Residents/attendees to give their feedback to Network Rail and the Tree Council on the Plans presented for 1) the Final tree cutting and fencing 2) the Replanting in particular the "Hadley Wood Trial". The campaign, jointly led by Hadley Wood Association (HWA) and Hadley Wood Rail User Group (HWRUG), delivered a Public Information Event for Hadley Wood residents on Thursday 7th June. Network Rail (NR) issued a letter of invitation and apology to lineside neighbours and fielded a senior team for the event. The leadership team from The Tree Council also participated. For a residents’ record of the meeting, click here. ​The HWA Centre Hall was filled with residents and representatives to hear NR’s apology for their “extreme” works undertaken here in the Thameslink Resilience Programme and to express some of the local feelings and concerns. Representatives included our MP, Ward Councillors, Enfield Council officers, GTR management, Railfuture, leaders of other local rail user groups on our line and leaders of the Grange Park campaign of 2010 when they suffered a similar experience. ​Setting the scene for the community, Robert Wilson outlined the impact of NR’s tree felling and fencing works, including extreme devegetation and areas remaining for better management, and Francesca Caine presented Hadley Wood Rail User Group’s campaigning credentials and described the course of the Treegate Campaign to date.